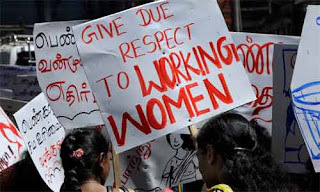 A large number of Hindu Tamil Women are working in the Gulf as maids and they are mercilessly trapped in modern day slavery. We Hindus are busy fighting in the name of caste, language, water… ;and our sisters and children are suffering at the hands of people who have attacked, massacred and marginalized us before and they continue to do it even now without any fear. Majority of Hindu Tamil Women who are seeking jobs in gulf support families devastated by the civil war in Sri Lanka. They are the sole breadwinners of the family. The women are sexually abused by recruiters and employers. They often end up earning nothing but abuse. We Hindus need to spread the word. We need to discuss such things in our dinning rooms, get togethers, temples and gatherings. Hindus residing in various parts of the world should come together to help Hindu women and children. Recruiters order Sri Lankan women to take birth control before working in Gulf.